Lady and the Blog → Personal Blog → Daily Diary: Seriously, Does This Count As Decorating? I’m so embarrassed about this! 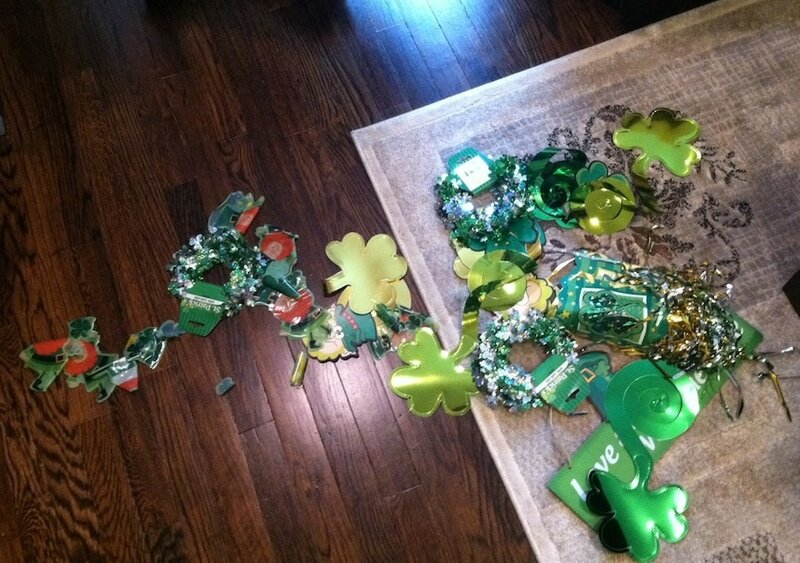 Last week, I had Bill take down our St. Patrick’s Day decorations from the attic. On Monday, Liam dumped the bag right next to my computer and said he wanted to decorate the house. I insisted we wait until Natalie came home from school. She’s obviously been home for many, many hours this week…. yet the pile of St. Patrick Day goodies remain untouched on the floor. Bad business! Do you decorate for every holiday? I try to AT LEAST do my front window. That way when the kids come home, they have something FUN to look at.